I’m late to the party when it comes to promoting podcasts for the month of March but I’m going to do it anyway. I mean, if I just heard about it maybe you haven’t heard about it at all. 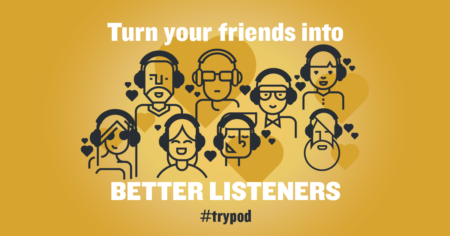 During the month of March, the hosts of hundreds of shows including Stuff You Should Know, Planet Money, Missing Richard Simmons, and Crimetown, will encourage listeners to introduce a friend, relative or coworker to a new podcast, and, show them how to listen if they don’t know how. 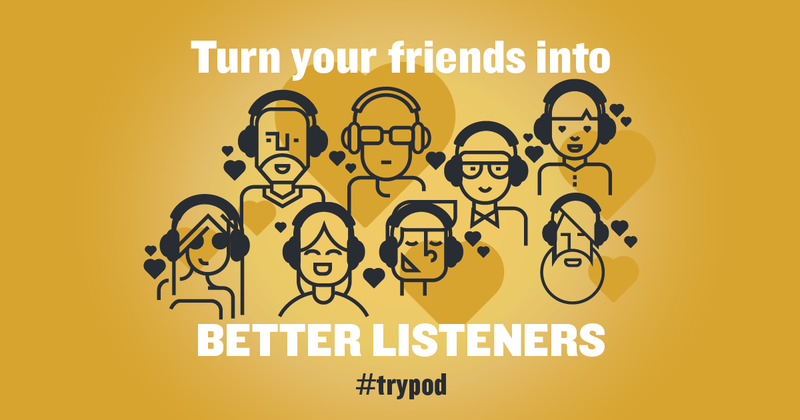 Listeners will be asked to share stories of why they listen and their favorite podcasts using the hashtag #trypod. I also like Mystery Show, although that could be on permanent hiatus. And if you haven’t listened to Limetown yet it’s worth checking it out. Finally, S-Town goes live today with 7 episodes and it sounds like it could be quite good. I predominantly listen to podcasts while driving to and from work although I do occasionally listen while doing my make up and while knitting or spinning. I think podcasts are a great way to pass the time, to learn something new, to have interesting things to talk about at cocktail parties, and to just use as a tool for cultural and personal awareness. Do you listen to podcasts? Tell me your favorites! I have not disciplined myself to learn about downloading and listening to podcasts. Yes, I am aware this is the 21st C. They sound interesting, I also need quiet space in my life. They might be a good companion to my machine sewing time, though. I like Happier with Gretchen Rubin, too. I usually listen to Wait, Wait Don’t Tell Me and The Moth from NPR as podcasts, too (because I usually miss the actual shows). I like Freakonomics, too. (I listened to Missing Richard Simmons . . . but that one turned out to be kind of a bust.) I love podcasts! I don’t listen to a lot, but I do like Wait, Wait Don’t Tell Me and our son and his girlfriend introduced us to 99 Percent Invisible which is funny and interesting. Check it out!! I’m not much of a podcaster and that’s mostly a time thing. I do love Wait, Wait Don’t Tell Me and try to listen on occasion. Thanks for the referrals…summer and gardening are just around the corner and maybe then! I listen to This American Life, Radiolab and The Moth, and I’ll be listening to S-Town today as Ira Glass has been piquing my curiosity for several weeks. Thanks for suggesting Literary Disco. I’ve been looking for a book podcast for quite a while now, and I’m going to enjoy their discussion of 1984. I rarely listen to podcasts. It’s a time thing, I guess; there’s just so much out there and I haven’t found a way to fit them in. Podcasts seem like a real commitment, too; you don’t listen to just one episode (I don’t think), it’s more of an ongoing thing/storyline. Isn’t it? And sometimes I just need silence. I like Pocket Talk, Modern Photo Solutions, Another Mother Runner and The Alton Brown Cast. During football season I listen to The Ex-Pats Podcast. I listen mostly while I’m making dinner or walking or on a long car ride. I use the Downcast app so I don’t have to worry about finding and downloading new episodes. It does it for me. It is like Feedly for podcasts. @Vicki, the podcasts I listen to are usually self-contained 30-60 minute “shows”. You don’t have to listen in order or keep up with a plot. Great recommendations! When I am at my pc, sometimes I queue up YouTube and listen to The Gentle Knitter and Fiber Trek. I love both of them – although, it is really not a podcast. I’m so excited for S-Town. My favorites are The New Yorker Radio Hour, Snap Judgement, On Being, and Studio 360. I could list a dozen more, too! I like The History Chicks and Nerdette. I am not really a podcast listener, but a FB friend talked about a podcast called “Sleep with Me” that is good for people with insomnia. And it is! It is a guy with a boring voice telling boring stories–sometimes he recaps whole episodes of Star Trek TNG in a sleepy voice. So that’s my podcast recommendation. I listen to What Should I read next, Curious Handmade, a bunch of other knitting, running and health podcasts. I listen all day while I work. Just started listening to a Talking Dead podcast, it’s two guys that go through the episodes scene by scene, makes me realize I must spend more time looking at my knitting as I miss a few things. One of my favorites had Paget Brewster on it, The Thrilling Adventure Hour. Unfortunately, it ended, I think except for a special or two. I still have a few episodes that I’m saving for some reason, same with Books on the Nightstand, just don’t want to hear the last one yet. I’m having trouble keeping up with the podcasts while I listen to books. I do love those same three, and of course Sara’s Hell Yeah Homeland! I’m mostly a knitting podcast listener. I do like serial, and I’ve listened to a bit of Revisionist History. It’s hard to keep up if I’ve also got an audio book going too. My listening is either during a short commute or walking the dog. Hard to listen to stuff in an apartment and a hubby who is home in the evenings. I do love the whole concept though. This American Life, Gastropod, Food52, On Being, This Nashvllle Life. I listened to the beginning of S-Town, and I’m not sure it’s for me. Let me know what you think.